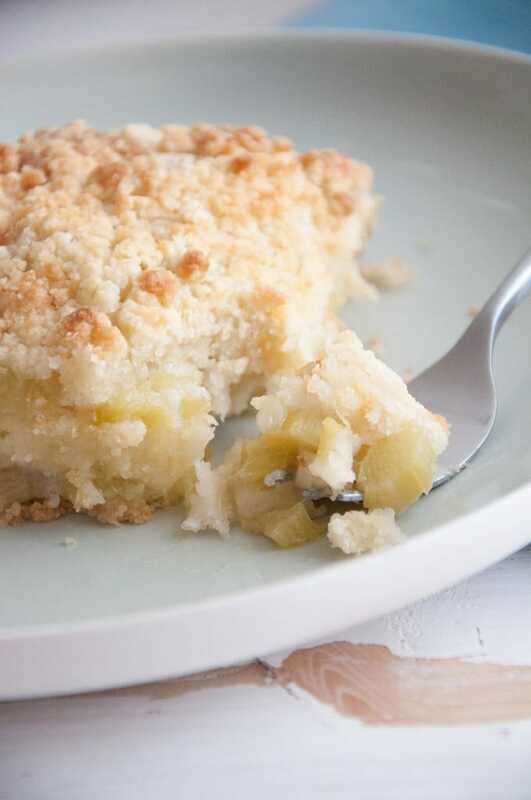 Recipe for a super fluffy vegan Rhubarb Crumble Cake – all dairy-free and egg-free. One-bowl vanilla batter + soft rhubarb + golden crumble on top = YUM! May I present the fluffiest vegan Rhubarb Crumble Cake ever! This cake has everything you want: a super simple one-bowl vanilla base, soft rhubarb pieces in the middle and perfectly golden homemade streusel on top. 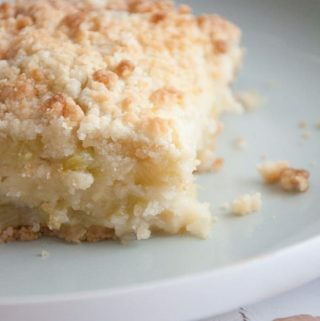 The sweet vanilla base and streusel will balance out the rhubarb’s tartness. This is the ultimate spring goodness cake. 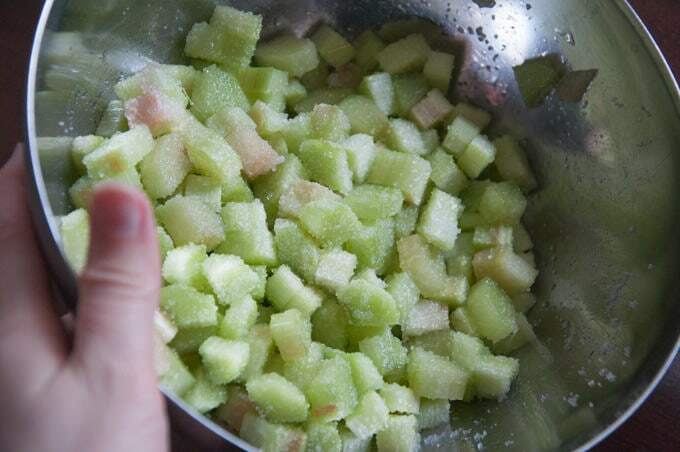 Cut the rhubarb in small pieces and sprinkle them with sugar. Let them sit for about 20 minutes. In this time, the rhubarb will get softer and lose some of its water. Drain the rhubarb before pouring it onto the cake batter. 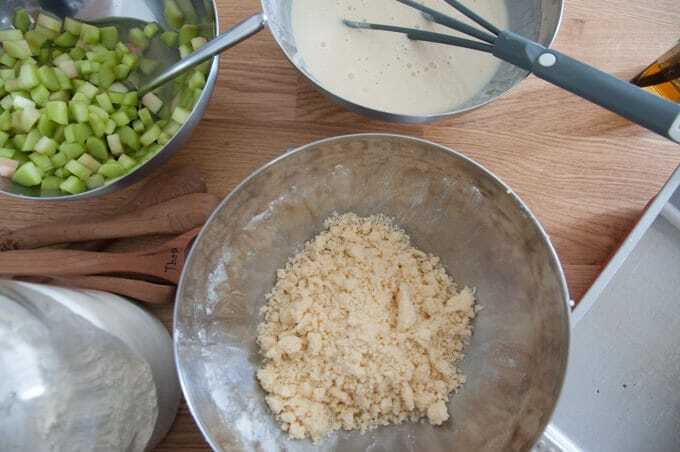 Here’s everything we need: Rhubarb on the left, the one-bowl vanilla batter on top and homemade streusel in the middle. 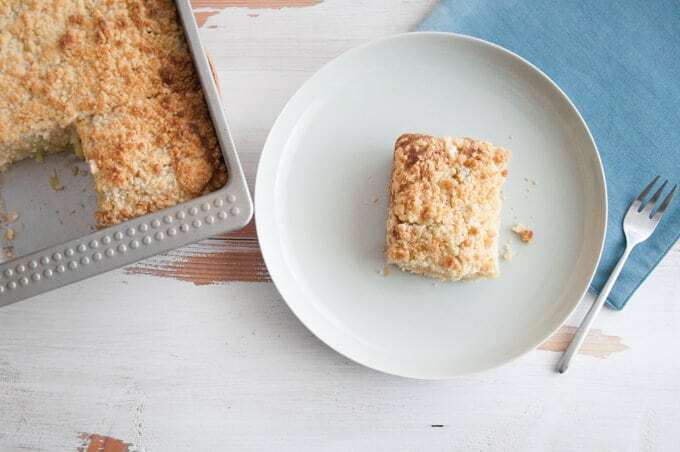 These simple streusel will make the perfect topping for our crumble cake and they are so easy to make! The baking dish I used is 10×8 inches. The cake is big enough for 6 portions. 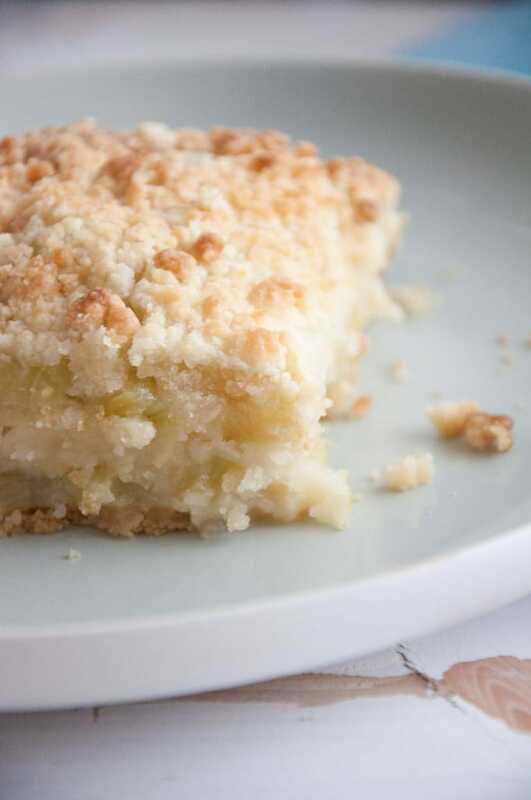 Recipe for a super fluffy vegan Rhubarb Crumble Cake - all dairy-free and egg-free. The cake consists of a simple one-bowl vanilla batter, soft rhubarb pieces and perfectly browned crumble / streusel. For the RHUBARB: Wash, peel and cut the rhubarb stalks in pieces. Put them in a bowl, and sprinkle them with 1 teaspoon of white sugar or your preferred granulated sweetener. Let them sit for about 20 minutes. For the simple one-bowl VANILLA BATTER: Preheat the oven to 360°F/180°C. Place all the dry ingredients for the cake base in a mixing bowl and combine, add the wet ingredients and whisk until it's a smooth batter. For the STREUSEL: Put the cold butter, all-purpose flour and sugar in a bowl, mix and knead with your hands until crumbly. ASSEMBLE and BAKE: Oil the baking pan lightly and pour in the cake batter. Drain the rhubarb and spread the pieces evenly onto the cake better. Sprinkle the crumble on top. Bake it in the oven for about about 25 minutes. When the crumble is nice and golden, your cake is ready. My baking pan for this cake was 10x8" / 26x20cm. This is the most stunning rhubarb crumble I’ve seen! It’s so elegant, clean, and WHITE! Haha! It looks like a sweet, buttery, lovely cloud just ready to be broken into with a fork! Thank you, Kyra! Hahaa, I always buy neat seasonal ingredients, even if I have no idea what I want to make with it. 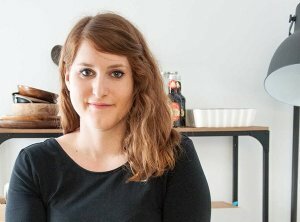 I can’t be bothered with thinking about recipe ideas when grocery shopping, I need the pressure of having it at home and actually making something with it. I love how the rhubarb crumble cake turned out, so buttery and soft. Hallo before I try this I have to ask what is coconut vinegar? I don’t know if I will find that here in switzerland …..can it be replaced with white vinegar? That cake was just amazing. :) I had the chance to try it and I’ve been to Veg-Heaven. I’m totally going to try some recipes at home. New ingredients are always a challenge but a fun one. It was so nice to meet you. Thank you! It’s so nice to hear from you, Kat! Thank you so much for leaving a comment! I’m so glad everyone loved the cake (at least no one told me otherwise :D ). It was such a fun day, I had a great time talking about a topic I’m really passionate about. I hope you’ll give your vegan week a try soon :) Let me know if you need any info on substituting anything. I’m always happy to help. Thank you for sharing this recipe, everything is great apart from one thing. I’ve never used xylitol before, and didn’t know anything about it, until I’d used it for this recipe. It causes a laxative effect in many people! Which I didn’t know till I’d eaten it! I thought it might be worth giving people a warning maybe? I have digestive issues and this made me ill for a day. I’ve since made it again just using sugar and it was great. Hi Emma, thank you for letting me know! You’re right, some people seem to have digestive issues with xylitol – especially when introducing the new sugar into their diet. I guess I was lucky enough to start with small amounts. However, I’ve changed it to white sugar in the recipe. Hi Bianca, thank you so much for posting this wonderful recipe. Just checking, there is no vanilla added to the vanilla batter, is that right? Thank you Bianca, this recipe sounds amazing and I look forward to trying it soon! Thank you for the delicious cake recipe. My family and I really enjoyed it! I only made one substitution (which is really good for me:)), I didn’t have coconut vinegar so I used apple cider vinegar. I also made a rhubarb sauce (cooked down rhubarb and sugar to taste) as a side to the cake. We loved the combo! Recipe looks awesome! Unfortunately, I’ve cut all of my rhubarb down for the year and it’s waiting to be used in the freezer. About how many cups of rhubarb do you think you used? Have you (or anyone) tried a GF variation? I made it in a smaller baking pan therefore baked it longer because the top wasn’t browning so the cake batter was slightly overcooked, but it was still delicious. I wish i could post a pic here because it looked great too!